"Your voluntary engagement might sometimes go unnoticed to the world, but your actions count in the communities that have benefited from your hard work." Nonprofits couldn't do their good work without volunteers - from board members and committee members to on-the-ground and behind-the-scenes supporters. What's the "real" value of a volunteer? 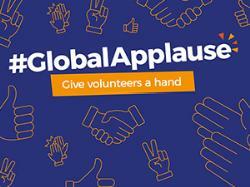 The Independent Sector currently estimates the economic value of a volunteer hour to be $23.56. That's a national figure. And it could be much higher, depending on the skills of the volunteer and if they are volunteering in a highly specialized capacity. Like an attorney who is providing pro-bono legal services. Now, think about how many volunteers you have…and how many hours they volunteer. It adds up. Fast. For instance, I work with a literacy organization that has nearly 300 volunteers, mostly tutors and classroom instructors. Last year, those volunteers gave 18,115 hours of service. At the current rate, that's more than $425,000 of value. Does the actual "value" of these volunteer hours really matter? Certain funders may ask you to match a percentage of the grant award. Volunteer hours may satisfy a part or all of that requirement. It's become increasingly common for grant applications to ask how you plan to sustain your program. Most people answer in terms of their donors (and their monetary gifts). Yes, those are important financial resources. At the same time, don't forget your volunteers (and their gifts of time and talent). Volunteers are invaluable human resources. The bottom line? Volunteers give you greater organizational capacity to do your good work. Why else should I track volunteer hours? Do you recognize your volunteers on their service anniversary? What about milestones, like 100 hours of service? Or 250? Or 500? If you have volunteers who volunteer this many hours over a 12-month period, you can nominate them for the President's Volunteer Service Award. Regardless of when or how you do it, a milestone recognition does three things. It shows your volunteers that you've been paying attention. It says you appreciate their tireless service to your organization. And, most importantly, it demonstrates that you value them as individuals. You've heard the saying: Good help is hard to find. Well, good volunteers are even harder to find. And when you do find them, you want to do everything you can to keep them. Remember, volunteers add real value to your organization. They give time. They bring talent. And those two add up to meaningful numbers you can use. Remember, too, to thank your volunteers, and not just once a year. Thank them often. Recognize their service (especially milestones). And celebrate their contributions. All year long. Make sure your volunteers know just how much you value them. Did you know that "fundraising or selling items to raise money" is the second most popular way to volunteer? Want more information on volunteers and volunteerism? View national highlights about volunteerism in the U.S.
Read "What Your Volunteers Need to be Happy,," which includes 10 tips on how to get volunteers to come...and stay.